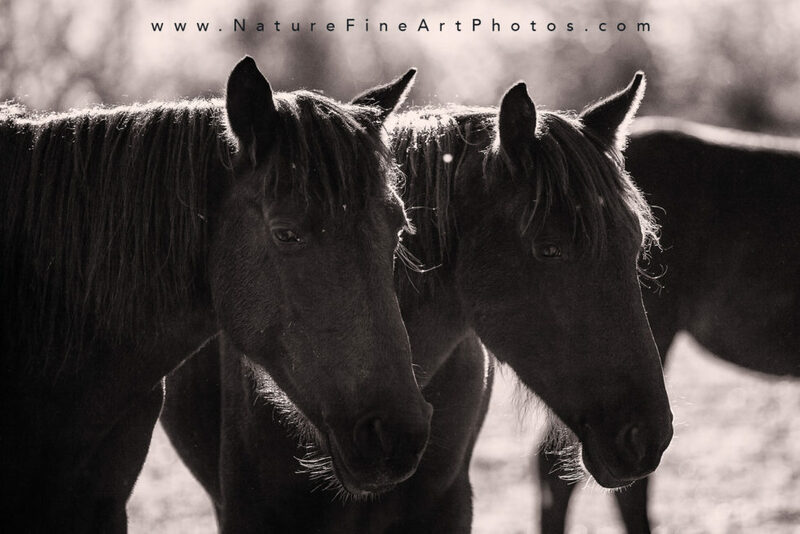 The tranquility of a pair of wild horses standing together. In my horse photography I try to capture the strength and beauty of the horse in their element letting their true personalities shine through. The spirit of the untamed majestic wild horse is still alive today. Wild horses live in a world without time restraints and commitments. They roam free through the deserts and the rural islands. Their connection to each other is felt as if their hearts beat as one. The stomp of a hoof, the raise of a head, or the twitch of an ear all have meaning to a horse alerting them of danger felt throughout the herd. Galloping along with their manes blowing in the wind, running through the rugged terrain, they remain in sync. The wild horses relish standing quietly together playing in a watering hole, grazing on vegetation or napping in the shade. In order to survive all these years, their raw intuition is impressive. The herd does as they are told by the lead horse and the story of the wild horses continues on.